Shrikhand is strained yogurt Indian dessert. 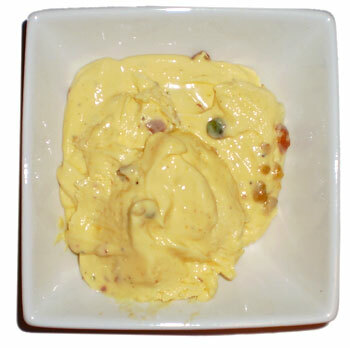 Shrikhand is served throughout India but more popular in Gujarati cuisine and Maharashtrian cuisine . Shrikhand is prepared by adding dried fruits, such as cashew, pistachio, almond, and fresh fruit such as mango (known as Amrakhand). Cardamom and saffron are two spices added to Shirkhand along with sugar. Strain whole milk yogurt with muslin cloth (cheesecloth) until you get a creamy yogurt. Alternatively use creamy Greek yogurt. To strain: Put yogurt on center of a cheesecloth and lift it by pulling cheesecloth’s four corners together. Twist and squeeze out the liquid gently. Continue squeezing and tie with string. Place the cheese cloth with the yogurt in a strainer (colander) and place everything over bowl. Put everything in the refrigerator for 2 to 3 hours. More liquid should drain out. The end result yogurt should be at least thick as sour cream. Add dried fruits, sugar, cardamom and saffron to the strained yogurt and lightly whisk it. Put in serving bowl and refrigerate at least ½ day before serving. 4 Garnish with nutmeg or more dried fruits before serving. For lower calorie shrikhand, use ¼ less sugar or use sugar substitute such as splenda.